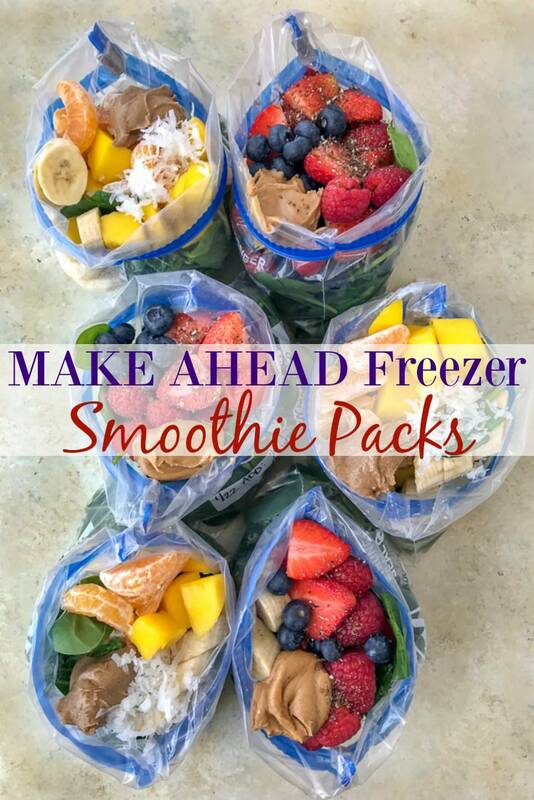 These Make Ahead Freezer Smoothie Packs are an easy, delicious way to prep smoothies in advance, so that when you’re ready to blend – you can just grab and dump! All you need to do is add avocado or yogurt, ice (if you prefer) and milk, water or juice of choice. One thing that my husband and I both love are smoothies! They are easy to make, are ready in minutes, and a healthy way to get those essential vitamins and minerals. When you prep a weeks worth ahead of time you save not only time, but take the guess work out of what to put into the blender. All you need to add is the freezer pack + milk of choice + protein and/or healthy fats. That’s it! 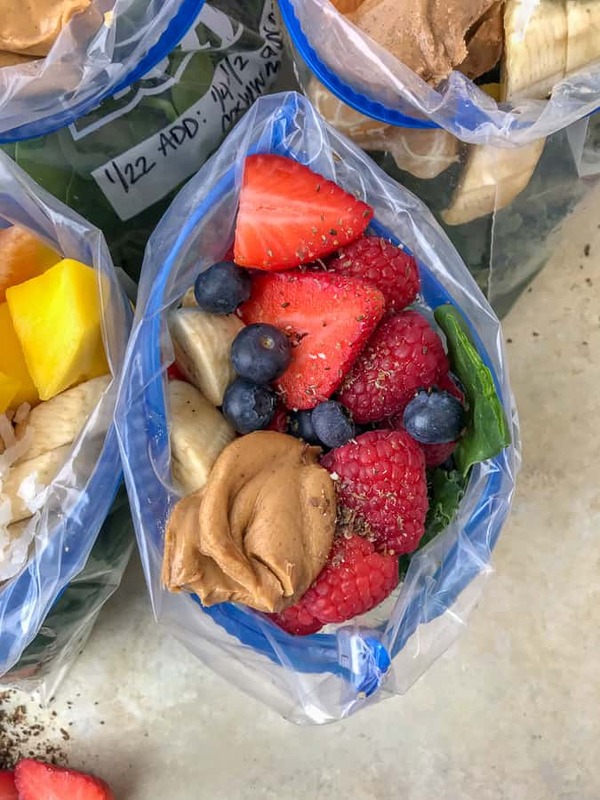 So instead of spending 10-15 minutes every single morning trying to decide, find, clean, trim, slice and prepare a smoothie, prepare them ahead of time to save yourself the time and stress. Plus – it’s a little extra time to sleep in when morning comes. And we can all agree that with some mornings, those extra 10-15 minutes count! 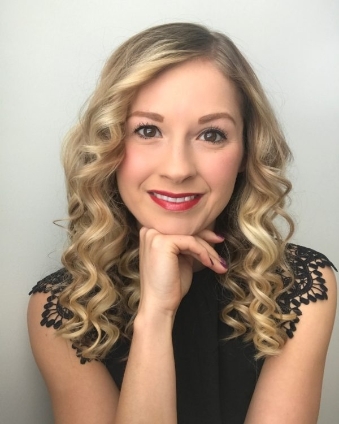 VERSATILITY – ADD WHAT YOU WANT! An amazing thing about smoothies is that you can add as little or as much of an ingredient as you prefer. Not a fan of bananas? Swap out for the fruit of your choosing. Don’t care for peanut butter (shun!)? Swap it out for almond butter, cashew butter or the nut butter of your choosing. 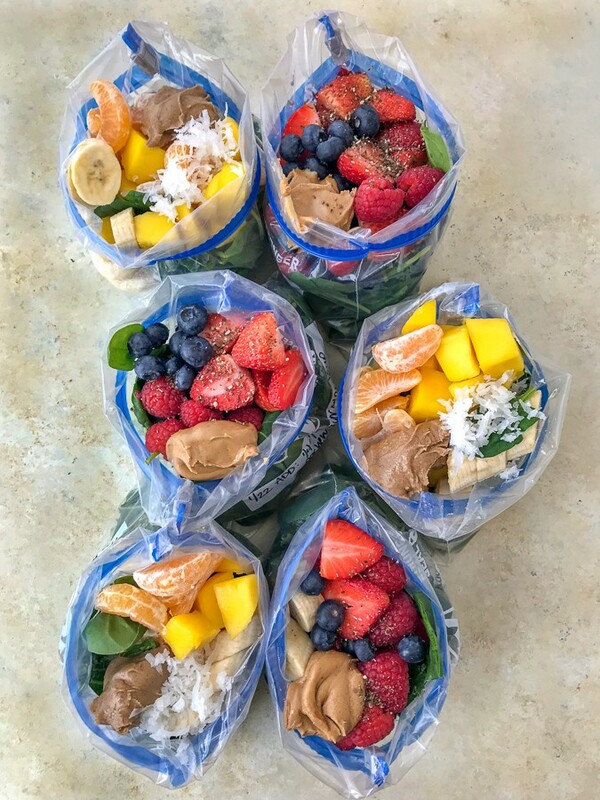 Great way to add protein to any smoothie! Don’t forget to add chia seeds and/or flax meal for healthy fats. An avocado works, too! Worried about the spinach or kale? You won’t even taste it! The only thing it is likely to do is turn the smoothie a strange color. No to clementines? Try pineapple chunks. Don’t forget to add your favorite yogurt! Prefer something more filling? Add a scoop of protein powder. My husband and I love this one when we are stuck in Michigan and wanting to feel like we are lounging in a beach chair, soaking up the sun with our feet in the sand and a cold beverage in our hands! I think my husband loves this one the best because it contains mango. I have never known someone to love mango as much as he does! He loves to add it to vanilla yogurt, as it makes him feel as though he is eating a creamsicle. HA. Divide the ingredients listed for each recipe (found in the recipe card below) into 6 separate freezer-safe bags. 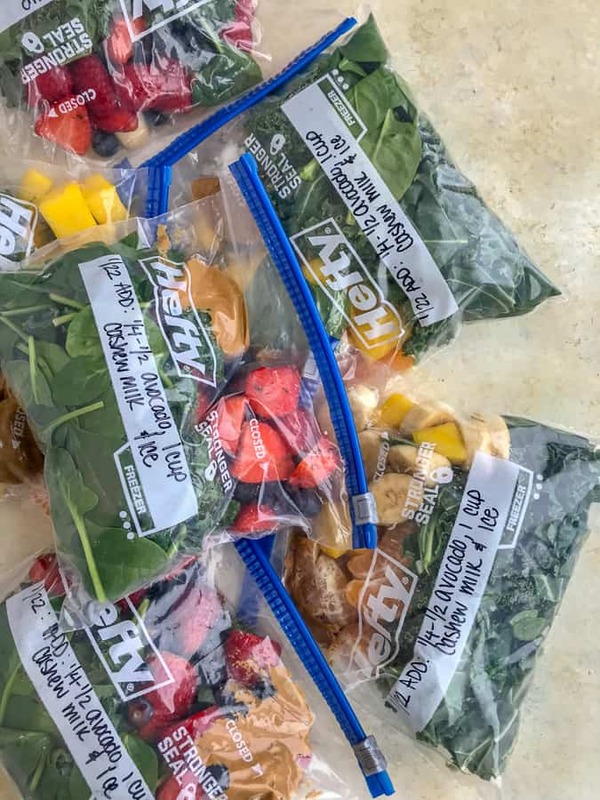 Seal each bag and place into the freezer right away. 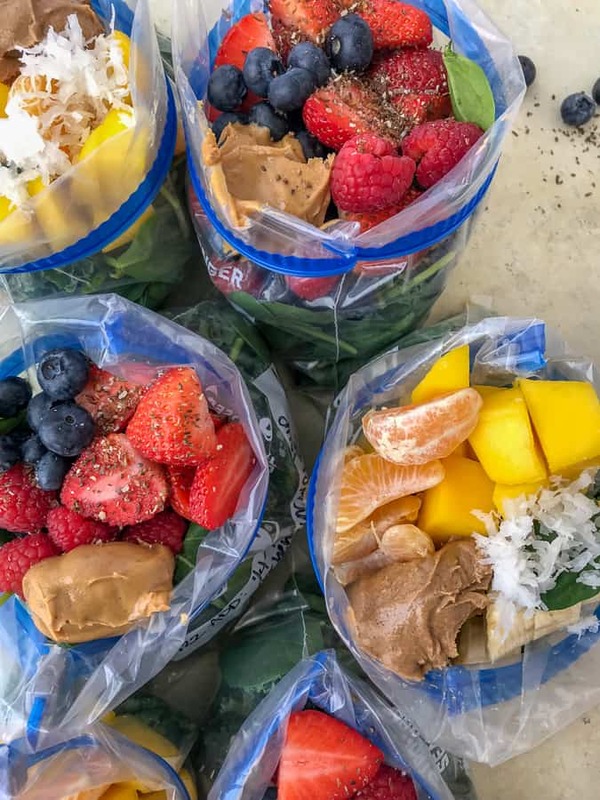 When ready to blend, dump the contents of the bag into a blender. Add in 1/2 – 1 cup of liquid (water, cashew milk, almond milk, unsweetened coconut milk, juice of choice, etc.). Add in avocado, yogurt, etc. If preferred. Use ice – if preferred. Blend away until no chunks remain. Can be stored in the freezer for 1 month. A simple and easy way to not only save time, but to get in your daily dose of vitamins and minerals! 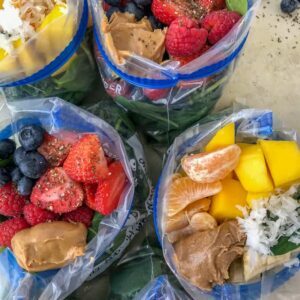 Two super delicious smoothie recipes that are guaranteed to please not only you, but your kiddos! 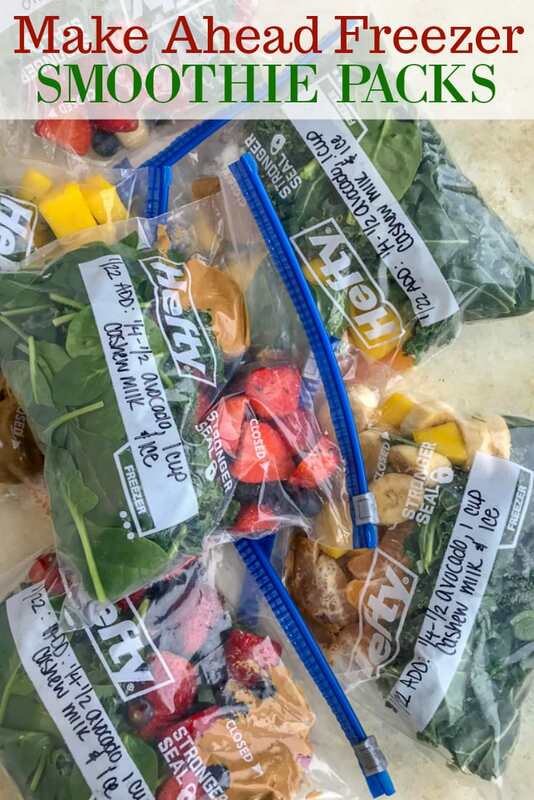 Seal each bag and store in the freezer right away. 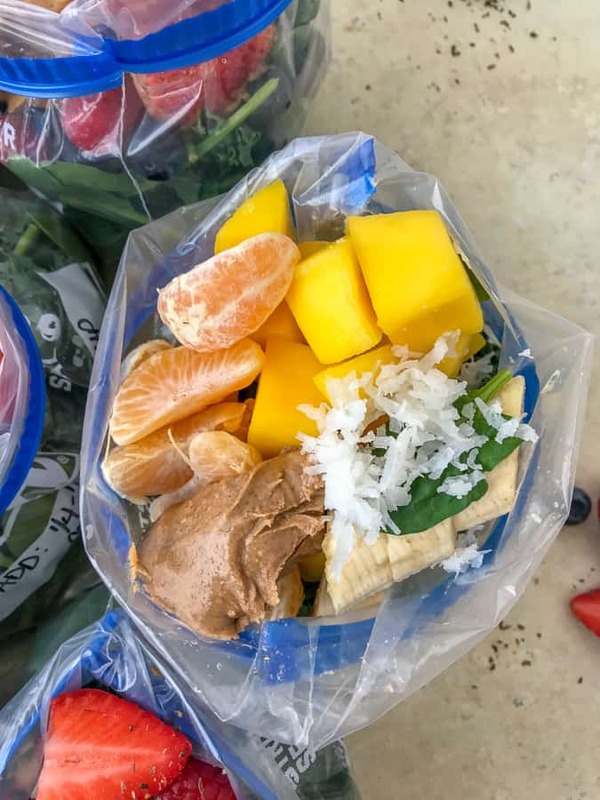 When ready to blend, dump the contents of one bag into a blender. Add in 1/2 - 1 cup of liquid (water, cashew milk, almond milk, unsweetened coconut milk, juice of choice, etc.). Add in 1/4 cup avocado or 1/4-1/2 cup yogurt, etc. If preferred. When blending, you can swap the greek yogurt for protein powder of choice. 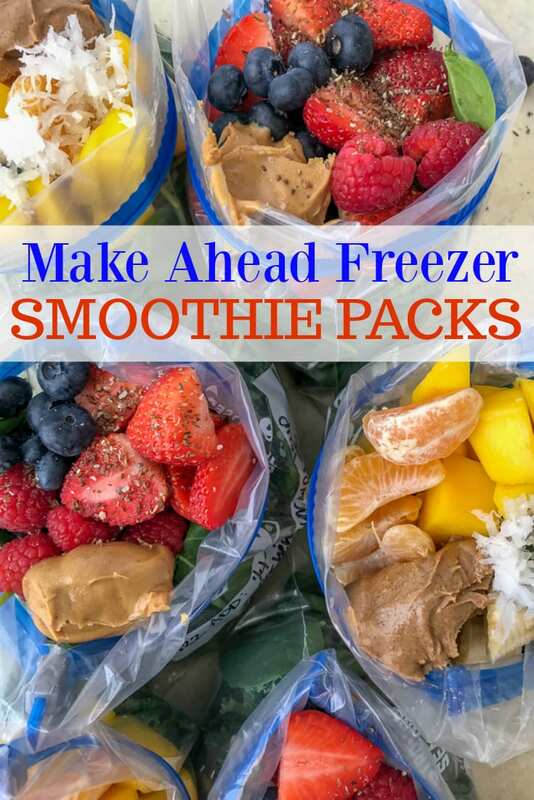 You can save more time by freezing the yogurt into an ice tray and then adding it to each bag. If you like a thicker smoothie, use less liquid. If you prefer a thinner smoothie, add more liquid. Nutrition label below is for the Triple Berry Smoothie pack only. Use an app such as My Fitness Pal to calculate each smoothie with any add-ins!